Trim the chicken breasts then lay them in a single layer in a foil pan. Bake at 375 F for 35-45 minutes or until chicken is cooked though and the juices run clear. Spray 9x13 pan with non-stick cooking spray. Place 6 slices of bread (or 1/2 the package of buns torn into pieces) on bottom of pan. Sprinkle 1/2 of the sausage and 1/2 of the cheese on top. Repeat the layers of bread, sausage, and cheese. In measuring bowl, add 3 eggs. Pour enough milk into measuring bowl (with eggs) to equal 3c. Add remaining 6 eggs and seasonings. Pour egg mixture evenly over top of casserole. oven; turn oven to 350. Bake 45-60 minutes or until golden brown. Adapted from Taste of Home A+ Recipes from Schools Acrossed America. Cook sausage, onion, carrot and celery over medium heat, until sausage is no longer pink. Drain off fat. In gallon size Ziploc bag: Add Meat Mixture, bouillon, tomatoes, tomato sauce, garlic and Italian Seasoning to bag. Close bag and let out all of the air. In sandwich size bag, measure out pasta. Put gallon bag and sandwich bag into another gallon bag to freeze. Remove soup from plastic storage bags. I cut them open with scissors. Place frozen soup in pan with 8 cups water on Medium High. Cook until thawed and bring to a boil. Add the Orzo pasta and cook until pasta is tender. Serve. This is great served with a salad and bread sticks. Makes: 10 servings, I do not half. I freeze 1 meal per family. 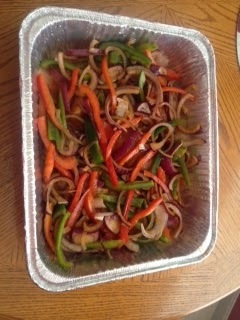 Arrange chicken pieces in a 9x13" freezer safe baking dish. Drizzle chicken with olive oil. Sprinkle with seasoning salt, garlic powder, and pepper. Place sprigs of rosemary around the chicken. Sprinkle fresh grated lemon zest over chicken. Arrange citrus slices on top of the chicken and rosemary. Thaw completely. Preheat oven to 400. Roast chicken for 30-40 minutes or until chicken is fully cooked (internal temperature = 165F). Let rest before serving.